Is Vegan Pet Food Safe? What Kind of Bowl Should You Use for Your Cat? Should you sleep with your cat? What is the best automatic cat water bowl? 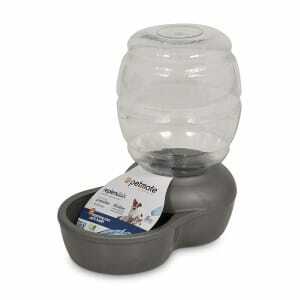 It holds one gallon of water, offering your pet plenty of means to hydrate properly. 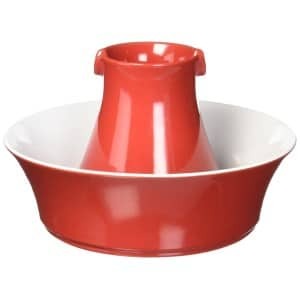 The stainless steel bowl is durable and safe for your cat. When you need to clean it, you only need to place it in the dishwasher and run a normal cycle. The product is available in three sizes, meaning you can opt for the big one if you own multiple pets or large dog breeds. Based on gravity technology, it will provide the right amount of water for your cat or dog at any moment of the day. The water bowl is hygienic, made of stainless steel, and dishwasher safe. The reservoir is made of durable BPA-free plastic to prevent spilling and chewing. Although sheer enough, the plastic body will give you a hard time telling the exact level of water remained. Some customers said the product leaks and is inconvenient to refill. Coming with a sturdy construction, you can rest assured this water dispenser will stay in place, no matter how playful your pets are. 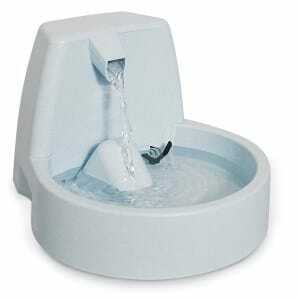 This creative pet fountain features a colorful and attractive design that will stimulate your pet’s curiosity. It is made of BPA-free and antibacterial PP resin, meaning it is safe to use and won’t cause allergies or other health problems. Thanks to the noise-cancelling technology, the product won’t affect your pet’s hearing. The detachable components are easy to clean. The water capacity of this product is 56 fluid ounces, which may not be enough for households with multiple pets or large dog breeds. It also tends to occupy a lot of space. Unlike other similar products, this one will also remove odor and impurities, while keeping the water tasting fresh for longer. The total water capacity of this item is 168 fluid ounces, making it suitable for homes with many pets. The free-falling stream encourages your cat or dog to drink more water, keeping them properly hydrated during the summertime. 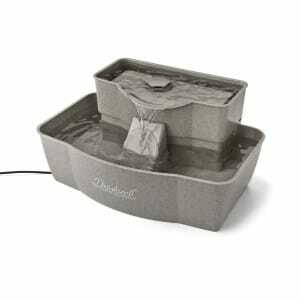 The stream is adjustable, so it’s also suitable for cubs or old pets that are slower. It comes with a replaceable carbon water filter. This item is not made for outdoor use. According to some customers, it has a flimsy construction that makes it easy to move from one place to another by your pets, causing leaks. It is easy to assemble and doesn’t occupy too much space, meaning you can place it anywhere around the house for your pets to see. 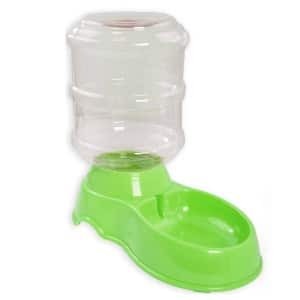 The most popular automatic cat water bowls available for sale are listed below. They are all popular with cat owners, and each one presents essential benefits your pet can enjoy while using it. Most of the cat water bowl reviews agree that the PetSafe PFD17-11855 is an excellent choice if you want to keep your cat well hydrated when you are away from home. Because it can hold one gallon of water, it will offer enough hydration for your furry friend, even when you leave for an entire day. The construction of this bowl is durable, with the lock-in reservoir made of sturdy plastic, and the bowl made from stainless steel. What is more important, it is safe for your cat, and it will not allow the development of bacteria. Your pet will be able to drink fresh water whenever they want, even when you’re not at home. Another great thing about this model is that you can wash the stainless steel bowl in a dishwasher, without any problems. Just make sure to use hot water, to properly sanitize the bowl every time. Do you want to offer proper cat care even when you’re not around? The isYoung Pet Fountain helps overwhelmed pet parents, by providing an alternative to the classic bowl of water that can quickly fill with debris and bacteria. This creative solution provides fresh water so that your cat can stay hydrated even throughout an entire day. 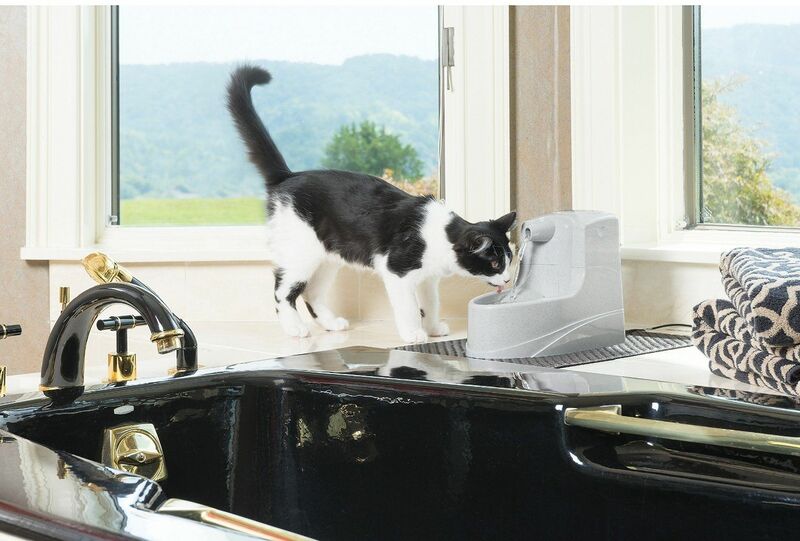 While other automatic pet water fountains do not come with too many extra features, this one offers the most important one: a filter with activated carbon that will make sure that the water your cat drinks is perfectly clean. For a healthy life for your pet, you could hardly do any better. The capacity of the fountain is 56 ounces, so it holds enough water for your cat to drink during the long hours you are away at work. Another thing worth mentioning about this model is the fact that it makes very little noise. If you’re looking for a good cat waterer for 2 cats, this particular product may be right up your alley. The PetSafe Platinum PWW00-13703 can hold up to 168 ounces of water, which is enough to keep two or more cats well supplied with fresh water. Its particular design makes cat owners fall in love with it at first sight. It is a well-known fact that cats are not crazy about drinking water and they need a bit of coaxing to do that and stay adequately hydrated. The free-falling design of this model will draw pets and make them want to drink from it. The fountain comes with a carbon filter that will remove all the unpleasant odors from water, helping a lot with keeping it fresh at all times. That also counts towards helping your pet drink enough water every day. Subsequently, it helps with preventing kidney problems in your cats. 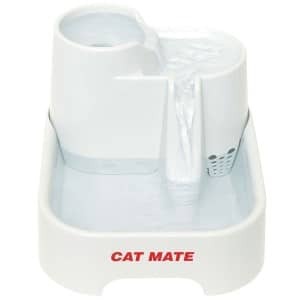 The Ani Mate Cat Mate 335 has everything you would expect in a cat water fountain. 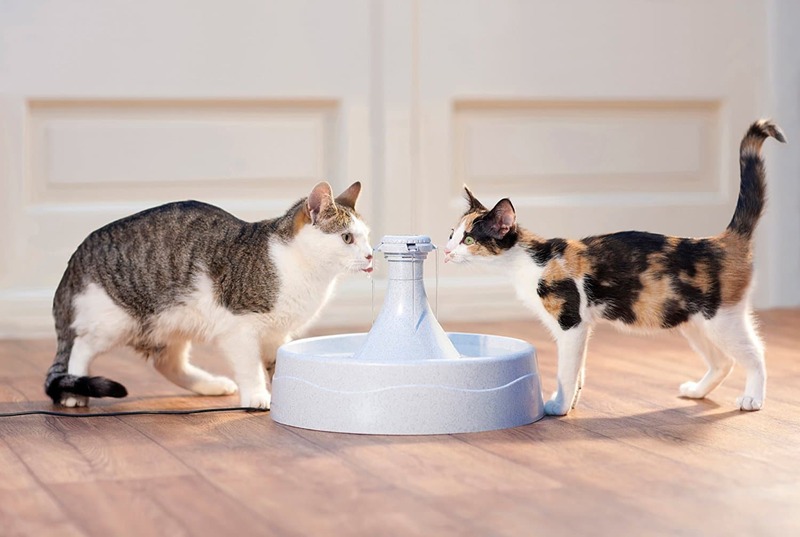 If you have multiple feline friends, you will love the multi-height design that lets each pet choose how they want to drink water. The model also comes equipped with a ramp that prevents splashes, so you don’t have to clean after it all the time. The unit has a special system for pumping the water into the mechanism so that it remains quiet at all times. This is a much-appreciated feature since most pet owners will let the automatic bowl do its work while they are at home and trying to catch some rest, too. The water is purified with the help of a special filter made with polymer and activated carbon. Your pets will drink clean and fresh water all the time, and that will help them be happy and healthy. The unit comes with a three-year warranty, a sign of the trust the manufacturer places in this specific product. Keeping your cats well hydrated can be a challenge, and that is why you need the proper water disperser by your side. Quiet and efficient, the FluffyPal Automatic Waterer-Green is the option you have been looking for without even knowing. Made from durable materials and capable of offering your pets the proper environment for drinking water, it is a product to consider. The plastic used for making this model is sturdy and BPA free, so there is no reason to worry about the water getting contaminated with dangerous chemicals. Another thing that must be mentioned is that the waterer is easy to pack and travel with it so that your pets remain hydrated all the time. The premium filter used for making the water tasty and fresh adds to the overall quality of this product. The model comes with a lifetime guarantee, and it will serve you and your pets for many years to come. If you have multiple feline companions, you need a waterer with reliable capacity. The Drinkwell 360 D360-EU-19 can hold up to 128 ounces of water, and it is an excellent water fountain that your pets will thoroughly enjoy. The free-falling design can be adjusted to provide your pets with something new and exciting, and, of course, make them drink more water. The carbon filter helps to remove all the bad odors from the water, and it will make it taste great. 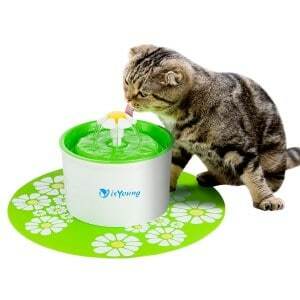 Cats are particularly intolerant towards water that smells or tastes bad, and that is why this type of pet fountain is recommended for proper hydration. The bowl is made from BPA-free plastic, and it contains no dangerous chemicals that may leak into the water. When you need to clean it, place it on the top rack of your dishwasher, and let the appliance do its work. Fresh water is essential for optimal health, and this particular model can help you keep your cats well hydrated. Busy pet owners know well that having cats drink enough water is a challenge, especially since they are not at home all the time. If you don’t have time to refill your cat’s bowl several times a day, an automatic model like the Petmate Replendish 24494 will come in handy. This gravity model holds plenty of water, and no frequent refills are required. 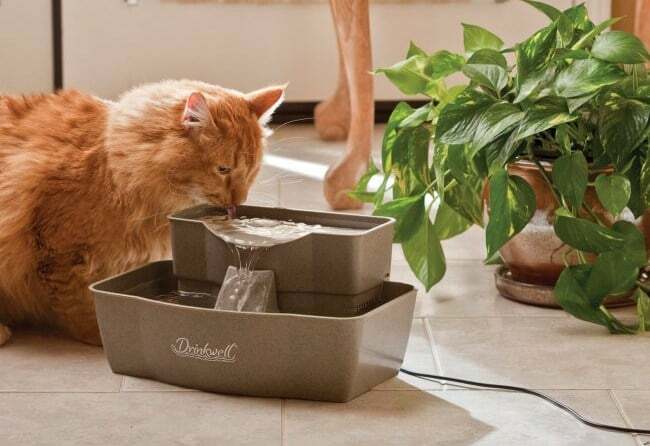 The filtration system installed on this model makes sure that the water your cat will drink is free of any dangerous bacteria, and that it also tastes and smells good. The filter can remove chlorine and other compounds in tap water that makes it so unpalatable for cats. The Microban protection offered is designed to prevent bacteria responsible for bad smells and stains. The waterer will stay clean and nice looking for a long time, and little maintenance is required. This model holds 50 ounces of water and keeps your cat well hydrated. Made by a company with a solid reputation in making pet supplies, the PetSafe Drinkwell Original PWW00-13704 comes with a patented design that promotes water drinking for pets. While cats are notoriously picky when it comes to drinking enough water, this simple, yet efficient design will convince them otherwise. Besides the visual appeal that will make pets think that the free-falling stream is a natural spring, there is a practical reason for using this design. The water gets adequately oxygenated when it falls into the ball, and that makes it even healthier and tastier for your pets. The internal charcoal filter does a great job at removing all the nasty odors and tastes from the water. Your cat will be much more motivated to drink enough water throughout the day. A model designed for households with multiple pets, the PetSafe Drinkwell Multi-Tier PWW00-13708 comes with a design that will help all of them stay well hydrated. First things first, the 100-ounce capacity is enough for multiple cats and even those of different sizes. There are, however, many other features that will convince you that this is an excellent water fountain for all your pets’ needs. The unit uses a submersible pump that produces very little noise. For this reason, many pet owners prefer it to other models on the market. The housing is made from BPA-free plastic, and the bowl can be washed in a regular dishwasher, without needing any special care. A healthy life begins with drinking healthy water, and this truth is not only applicable to human beings but animals, too. 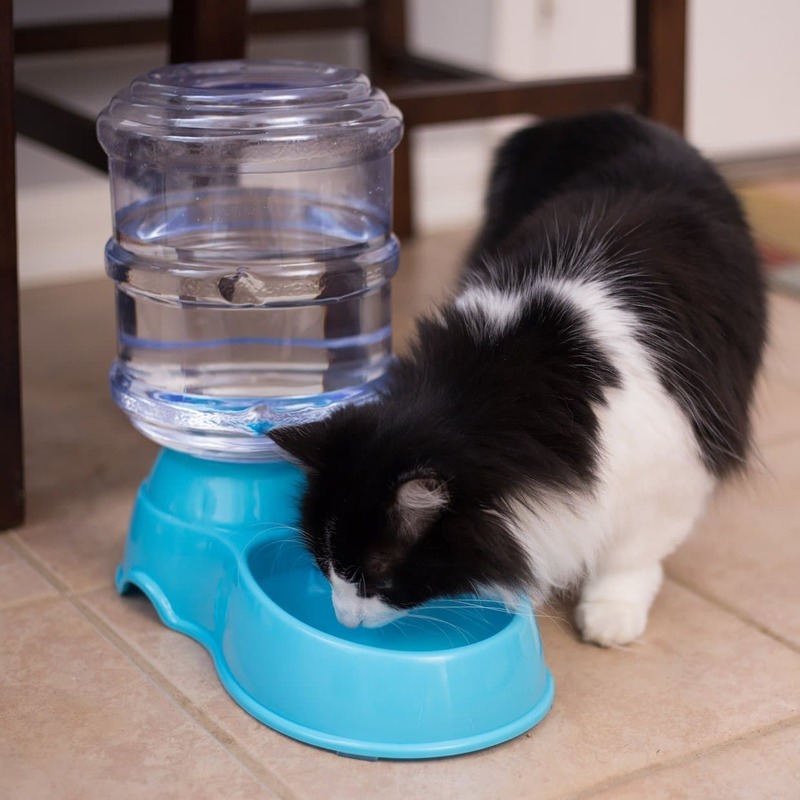 If you want your pet to drink enough water, a good solution would be to pick this reliable model that will provide your cat with fresh drinking water every day. The first thing you may notice about this particular model is the attractive design. Besides being stylish, the PetSafe Drinkwell Avalon PWW00-14376 offers a wide range of benefits for your cat. The unit has a 70-ounce capacity, which is enough for supplying a medium size pet with enough water every day. The two streams of water falling into the bowl ensure that the water always stays fresh. As it falls, the water traps oxygen molecules in its structure, which gives the water its fresh, pleasant taste. Cats, in particular, appreciate fresh water, as they never like to drink stale water, and they can feel odor-producing bacteria with their acute sense of smell. The fountain is made from ceramic, a sturdy material that does not allow the development of bacteria, and it is also easy to clean. The unit comes with a carbon filter that will do the job of removing all the bad tastes and smells from the water. Cats are quite complicated creatures when it comes to drinking water. They can develop bad habits such as trying to drink water from a toilet, and that might make you wonder why they prefer that instead of their bowl. The thing with cats is that they hate stale water and they aim for water that falls freely. 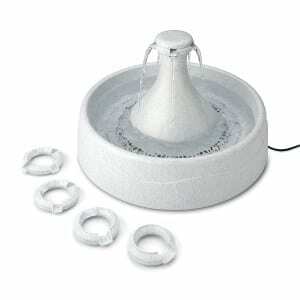 What you need to do is to get a cat fountain, and you will find right away how to pick the right one. Depending on how many cats you have at home, you may want to go for a larger or a smaller cat fountain. Cats do not drink a lot of water, but you still need to ensure that each of them will have enough. If you watch a little closer, when you’re shopping for the right automatic cat water dispenser, you will notice that the models available feature different capacity values. It is essential to decide on this aspect before evaluating other features. The number one reason why pet owners decide in favor of an automatic waterer is the fact that they need to spend a lot of time away from home, a time during which their cats remain unattended. Pick a model with a larger water capacity if you have more than one cat. It is preferable you have more than less, and that all your pets get the necessary hydration they need. There are various designs available right now. 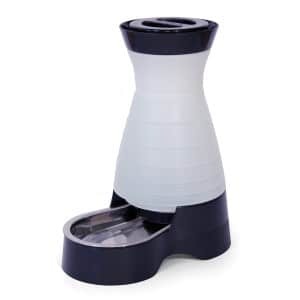 The perfect automatic cat waterer, as specialists and pet owners think, is the one that can make cats drink more water. Since these animals do not drink a lot of water by default, it can be tricky to make them see the water source you place at their disposal as being something worthy of their consideration. A free-falling stream is a design that so far has proved successful. As already mentioned, cats hate stagnant water. A stream that moves all the time will surely draw their attention and they will feel more enticed to drink more. A double tiered design also helps cats of different sizes to reach the stream of water. There are certain things you need to bear in mind when feeding your cat and supplying it with a source of water. In the case of a cat food mat, as well as a water fountain, you will want to make sure that no dangerous chemicals will get into your pet’s water and food. In case the water disperser you intend to buy is made from plastic, you should get one that uses BPA-free materials. Stainless steel and ceramic are better choices, but usually more expensive. Taking the safety aspects even further, it must be mentioned that the water fountain you pick should come with an active carbon filter to remove all the bad odors and tastes. You should be able to replace the filter with ease, for maximum convenience. A few things may also be vital for you. If you want an excellent cat bowl and not one that is just good enough, you may want to take the following into consideration. For instance, it would be a good idea to get a model that doesn’t make a lot of noise. While you’re at home, you most probably don’t want to hear the cat’s water fountain making loud noises. Another thing you may want to see in a cat bowl is non-slip feet. Your cat may feel tempted to move the water bowl around and cause splashes, but that won’t be possible if the unit doesn’t budge from its place. 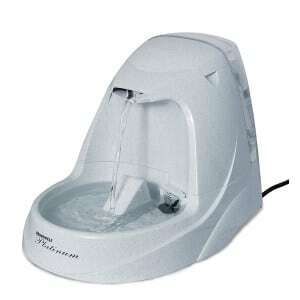 There are a few things that make automatic water bowls for pets a better choice to regular models. They will be shown right away, and they might just convince you to purchase this type of waterer for your beloved furry friend. It is essential for cats to drink enough clean water every day and they are very specific about not liking water that stagnates, smells bad, or is just not to their liking. An automatic bowl changes this, by supplying the cat with fresh water, at any given moment. The use of a carbon filter helps with removing all the bad tastes and smells from the water you supply your cat with, and that is a significant advantage. Your cat will be healthy, by drinking enough water, which is essential for combating kidney problems. This is an aspect that matters to pet owners, especially if they are away from home a lot. If you use a regular bowl for supplying your cat with water, you will have to make sure that the water is fresh, by refilling it every few hours. The automatic waterer will take care of this for you. You won’t be bothered, and your cat will benefit from fresh water without any inconvenience on your part. Your peace of mind is assured, and you don’t have to feel guilty for being away from home from dawn till dusk, as your job and lifestyle requires. In the wild, cats take the necessary hydration out of the moist foods they eat, but more often than not, they eat dry food as house pets. By offering them the possibility to drink water from a free-falling stream that looks like a real fountain, you will just make your cat happier and healthier, at the same time.